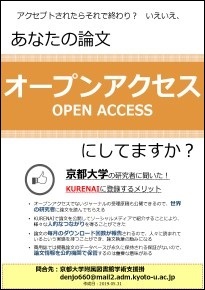 Kyoto University Library Network - What's Open Access? Kyoto University Library Network > About Open Access > What's Open Access? Open access academic articles can be accessed free of charge from all across the world via the internet. More citations by peer researchers can be expected. Authors themselves can access their own articles online anytime, anywhere. You can deposit your articles in an institutional repository that your institution operates. (Please note that some journals set conditions for self-archiving.) Kyoto University Affiliates can deposit their research results in Kyoto University Research Information Repository KURENAI. Recently, many journals provide an open access option to make your articles open access immediately after the publication by paying article publishing cost (Article Processing Charge, APC). When you consider which journals to submit your papers to, "Web of Science" and "Scopus" can provide useful information about journals. - You can check whether each journal is open access or not. - The statistics and evaluation indices based on the citations in the papers covered by each database are also available. Kyoto University associates may get discounts of the APC. Please check the list below if a discount is available, before submitting your manuscript to the publisher. Below is the most well-known definition of open access in the Budapest Open Access Initiative (BOAI) 2002. The Japanese government is also accelerating its effort to facilitate open access, especially open access of research results funded by public grants.